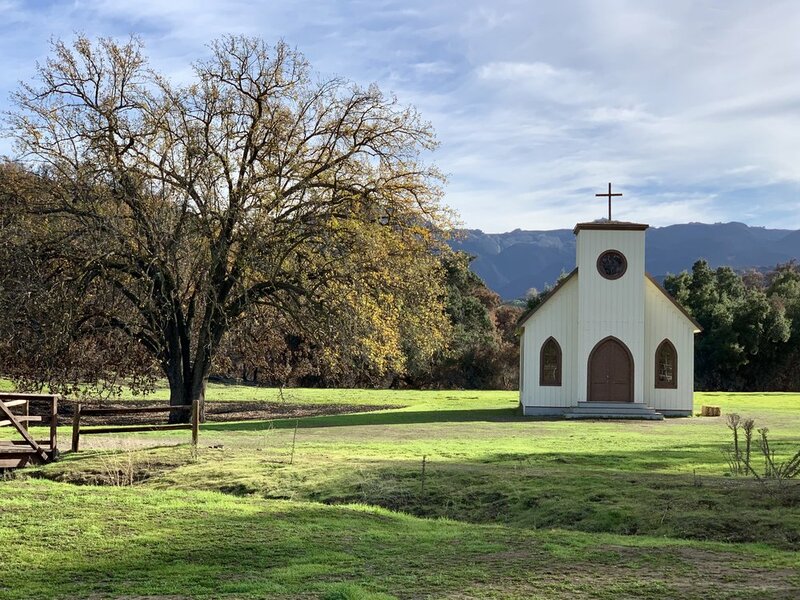 The church still remains at Paramount Ranch; it and the railroad station also survived while the main set was destroyed in the Woolsey Fire. We've all watched countless westerns filmed at this constructed town setting since the early 1900's. 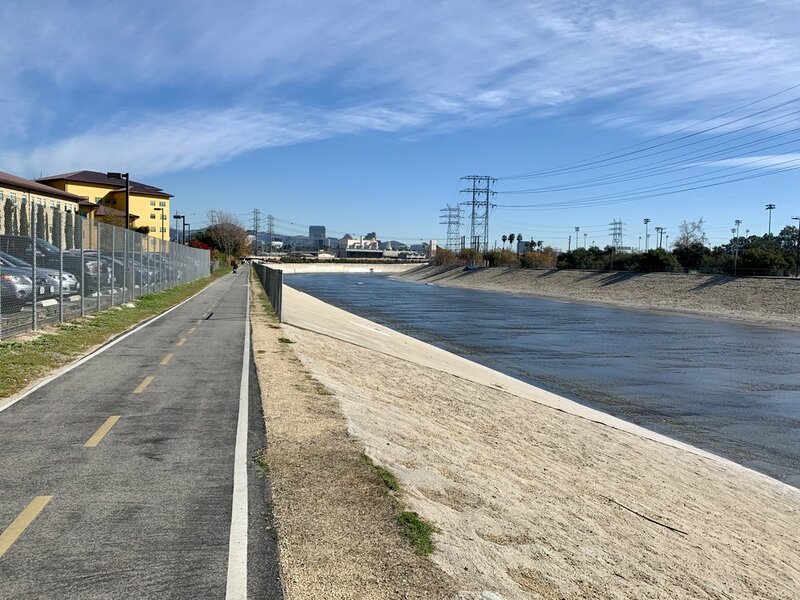 The Los Angeles River Cycleway. Once I got to Ventura from Santa Barbara, I called my old childhood friend Debra Dralle in Woodland Hills in north LA. I was in luck. I had stayed with Debra on my GRID trip two years back, so she and her husband Richard weren't surprised to see me arrive the next day on a fully loaded bike. Getting to Woodland Hills from Ventura presented a small challenge - such as the Santa Monica Mountains. It was raining, and I was challenged by the climbing, so I didn't notice the clues I was passing through the Woolsey Fire area. Fast moving and capricious, that fire was one of many that has turned life on its head. Much has been written about the intensifying and record breaking fire seasons in the American and Canadians wests. Here's one example. Of course, climate scientists tell us this is only the beginning. Record droughts, warmer temperatures, longer fire seasons, and encroaching development are the new normal, which isn't going to be normal at all. There's no normalizing the future when it comes to climate. 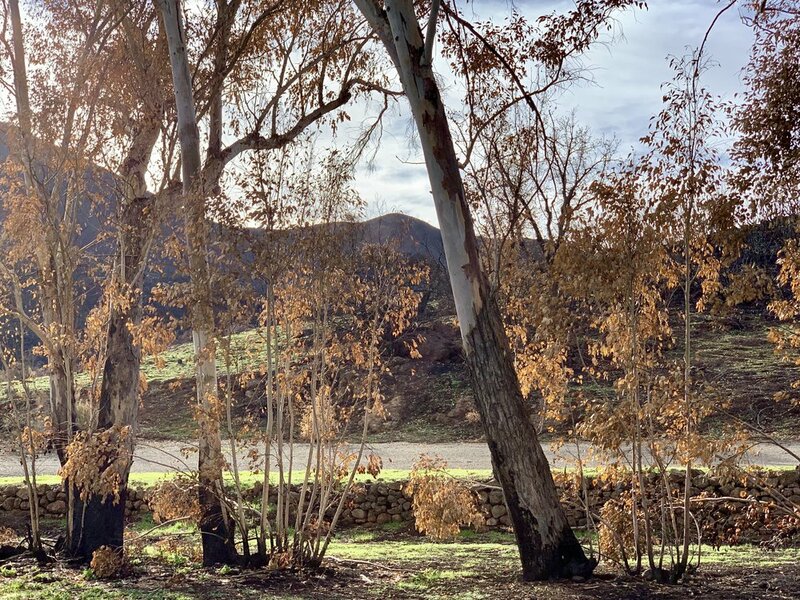 Fortunately, I had a chance to rectify my poor observations the next day when Debra drove me back to the Paramount Ranch, which - sadly - had burned to the ground in November of 2018. As we drove, I asked Debra if she knew of climate deniers living in the area. She said no; in fact, her view is that southern Californians are united around climate change - the fires of the past several years have diminished any doubts. 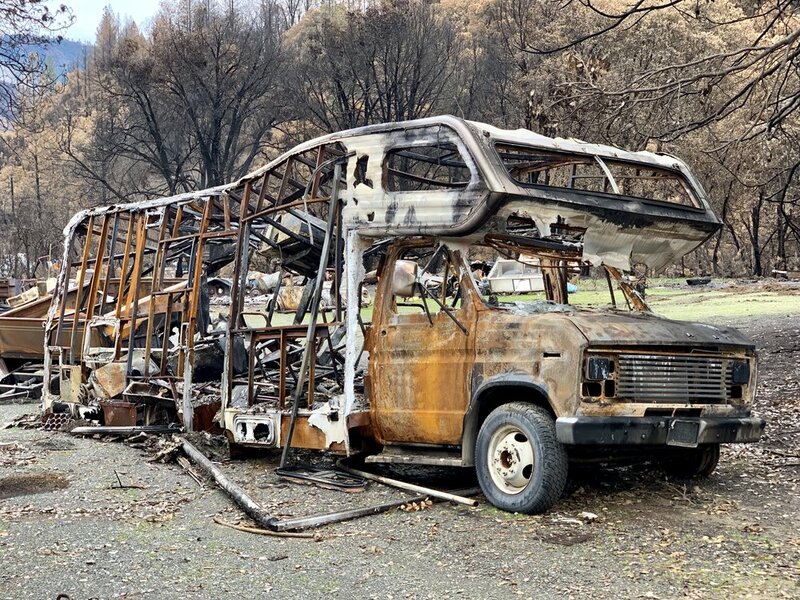 A large burnt out camper van sits by a highway near Delta, Ca. 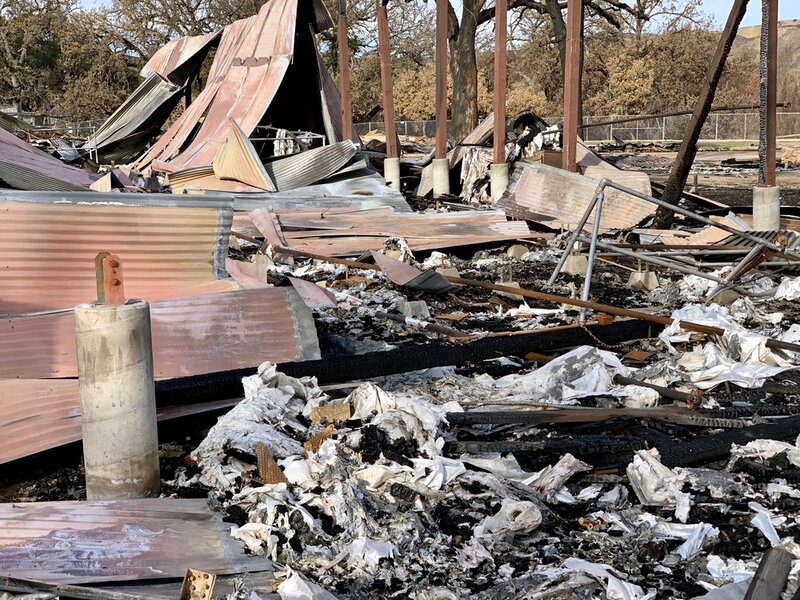 The Woolsey and the Delta fires took place in September and November, 2018, respectively. Today I read a comment by Tom Di Liberto, a scientist who worked on a well publicized Ocean Warming Report. He was quoted as having said that he thought we wouldn't reduce GHG emissions meaningfully until 2040. His comment made me wonder. There's something beautiful about a fire area in recovery. Only 3 months after the fire, a hillside in the Santa Monica Mountains near Paramount Ranch makes a comeback. What will our "pain point" be? Because climate change is as real as the sun, the shoe will drop on climate denial at some point, and we will finally unite in our understanding of what we are up against. But how many people will die first, how much degradation will we endure, how crippled will our economy have to become? Hopefully sooner, rather than later, Americans will say, "enough is enough", and put their shoulders to the wheel of change in a serious way, joining the many other countries attempting to transition their own economies. Some days that seems a long way off - especially as I cycle through the desert near the Salton Sea in January. But there's nowhere to hide. Check this out. 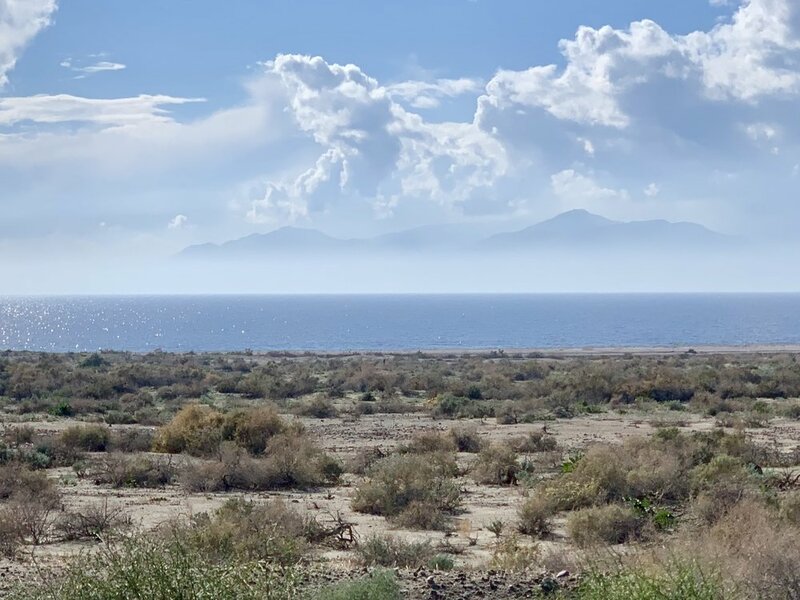 The northern and eastern shore of the Salton Sea is remarkably empty. The first 20 miles of the coast from the north shore are protected by at least three county parks. I was surprised and delighted to see this. Some days there is progress. I've written in many previous posts about the Citizens Climate Lobby, but I have not yet mentioned that CCL has helped two carbon dividend bills become introduced in Congress. Here is the House Bill, and here is the Senate Bill. Please check them out. If you find these thoughtful bipartisan climate bills hopeful, let your Representative and Senator know you support them. We know that politicians respond to popular will, so we must make it clear to policy makers that we expect them to be effective leaders on climate. 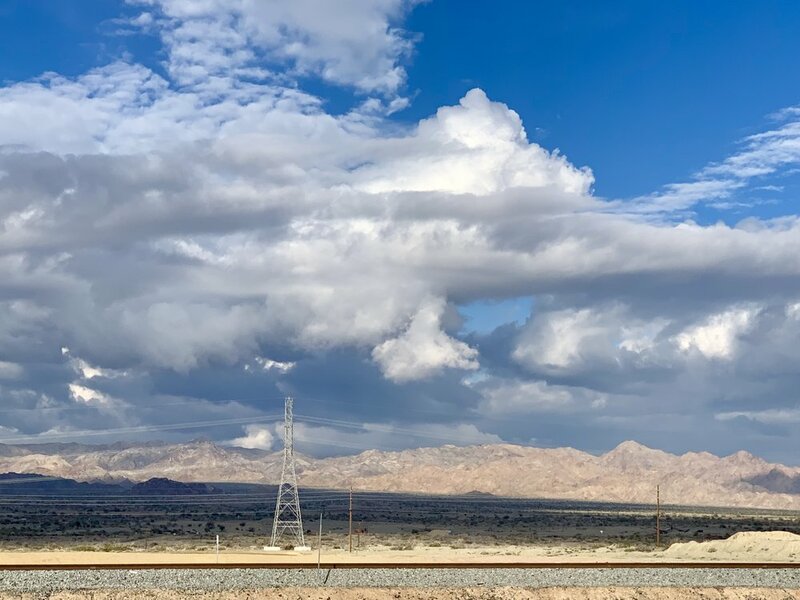 Looking east away from the Salton Sea toward Joshua Tree National Park. Someone told me that Joshua Tree poachers were in the Park because of limited staff during the government shutdown. If that's true, it's heartbreaking. This is no small task, as we all know. The world's largest economy (ours) is dominated by policies favoring corporate interests and rich corporate-bought climate deniers who are outside mainstream thought, and insulated from extreme climate events. Imagine what this must feel like in smaller countries. "Interestingly, we are in Ecuador right now where everyone acknowledges climate change as an obvious event, and not a divisive partisan issue, where private industry and gov't are investing in "clean" infrastructure like solar, and electric/LPG public transport. Also, sadly, is the realization that it, like most developing countries, they are powerless to slow or curb global climate change, as despite all efforts, the world's biggest economies will dictate how climate change plays out... which doesn't give one cause for optimism, currently." The pass from Banning to Palm Springs is quite windy and there are hundreds of wind turbines along the way. They can be attractive, and far less noisy than traditional oil wells. There's so much to do. And I think the most important thing of all is not to capitulate to dispair or cynicism, no matter how large the obstacles seem. We've proved the resiliency of our species over and over. Yes, we may be entering the greatest challenge we've ever faced, because none before now has required no less than global economic transformation. Clearly this is no time for "me first, or us first" policies. Let's screw our collective heads back on straight and meet this historical moment with clarity and resolve. All photos, unless credited or otherwise noted, are copyrighted property of the blog post author.